Operating a pawn shop in a small neighborhood, Cha Tae-sik now leads a quiet life. His only connection to the rest of the world is a little girl, So-mi, who lives nearby. 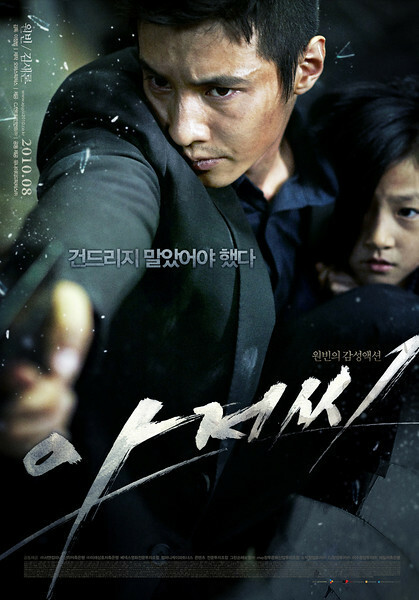 A heroin addict and So-mi’s mother, Hyo-jeong, smuggles drugs from a drug trafficking organization and entrusts Tae-sik with the product without his knowledge. When the traffickers find out about this they kidnap both Hyo-jeong and So-mi. The gang sends a number of thugs to Tae-sik’s pawn shop to retrieve the stolen drugs, but is easily overpowered by Tae-sik, making his identity ambiguous. However, upon learning that the gang now has in their possession both Hyo-jeong and So-mi, Tae-sik gives the beaten gang members what they are looking for. Cha’s initial reluctance to get involved with the girl and his mysterious past are played very effectively. They come up with a reasonable background without the heavyhanded feel of a lot of “mysterious strangers who happen to be deadly assasins” so common nowadays. His feelings toward the young girl go from coldness to warm smiles as he regains his humanity through his pursuit of her captors. Just an excellent action movie.